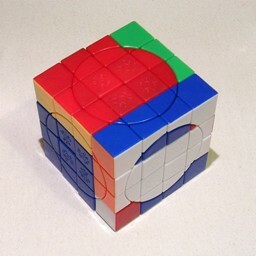 The Crazy 4×4×4 Cube is a 4×4×4 Rubik's cube where each face has a circular region in the centre of each face that stays stationary when the outer layer is turned. The region is as it were fixed to the inner layer. In Crazy Cube I the radius of the circular region is smaller than the layer thickness, so that the circle cuts each of the four square centre pieces in two. In Crazy Cube II the circular region is just large enough to contain the four square centre pieces, and the circle cuts a small part off each of the eight edge pieces. 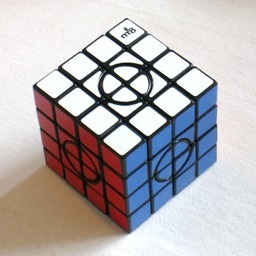 The Crazy Cube III has an even larger circular region that also cuts a small part off each corner. 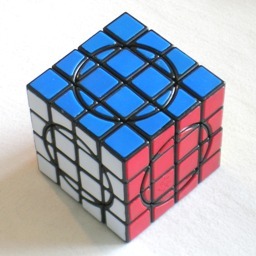 A normal 4×4×4 Rubik's Cube could be considered to have a hidden 2×2×2 cube at the core of it. It is interesting to note that the new centre parts on the Crazy Cube I are essentially the facelets of this core 2×2×2 brought out to the surface. The same holds for the square centre parts of the Crazy Cube II and III. The new small edge pieces on the other hand take the place of the ordinary 4×4×4 face centres. They move in pairs, and each pair of small pieces corresponds to an ordinary face centre piece on a 4×4×4 supercube (i.e. a 4×4×4 where the centre pieces of a face are distinct). On the Crazy Cube III each corner part is moves in tandem with a pair of small edge parts, so it does not really bring anything new to the puzzle compared to Crazy Cube II. This leaves 8!·37·8!·37·24!·24! / 4·24 = 31,180,187,340,244,394,380,451,751,732,775,816,935,095,098,996,162,560,000,000,000 positions, or about 3.1·1061 positions. Exactly the same holds for the Crazy Cube III as its additional small corner parts are fully determined by the locations of the small edge parts. The Crazy Cube I is almost the same as II, except that instead of small edge piece pairs we have outer face centre pieces. These come in six sets of 4 indistinguishable pieces. That means there are 4!6 ways to invisibly rearrange them, but only even permutations are possible while keeping the corners fixed. The Crazy Cube II therefore has 4!6/2 times as many positions as the Crazy Cube I. The Crazy Cube I then has 326,318,176,648,849,198,250,599,213,408,124,182,588,293,120,000,000,000 positions, or about 3.23·1053 positions. The same notation will be used as a 4×4×4 cube. The faces are denoted by the letters L, R, F, B, U and D (Left, Right, Front, Back, Up and Down). Clockwise quarter turns of a face layer are denoted by the appropriate letter, anti-clockwise quarter turns by the letter with an apostrophe (i.e. L', R', F', B', U' or D'). Half turns are denoted by the letter followed by a 2 (i.e. L2, R2, F2, B2, U2 or D2). The internal slices will be denoted by the lowercase letters l, r, f, b, u and d, and the type of move is shown in the same way as normal face moves. Note that these letters mean the slice only, so such a move will not disturb the corners of the cube. Phase 1: Solve face centres. By turning only two layers at the same time, you treat the 4×4×4 as if it were a 2×2×2 cube. Use any method for solving the 2×2×2 cube to put the face centre pieces correct. The next few phases are essentially a standard "Edge Pairing" solution to the 4×4×4 cube. Phase 2: Solve outer centre pieces (Crazy Cube I only). Hold the cube so that the U face contains an unsolved centre. Find an outer centre piece that belongs in the U face (it matches the colour of the U inner centres), but isn't in the U face already. Hold the cube so that this piece lies in the Front or Down face, while still keeping same face Up. Turn U to place a wrong outer centre piece at the bl position. If the piece you want to insert lies in the Front face, then turn F to place the piece in the dr position and do the sequence rUr'. If instead it lies in the D face then turn D to place the piece in the br position and do the sequence r2Ur2. Repeat a-c until all four U outer centre pieces are correct. Repeat the steps a-f until all the centres are solved. Phase 3: Match up the edges. In this phase the edge pieces are matched up to form matching pairs. Find any edge piece that is not yet matched up with its twin edge piece. Hold the cube so that this piece lies at the UBl location. Find the matching edge piece. Use any face moves to bring it to the UFr location. Find the edge piece that matches the UBr edge. 1. If it happens to lie at U F l, then do FU' R F'U r' U'F R' UF' r.
2. If it lies elsewhere, then bring it to the U R f location without disturbing the U F and U B edge pairs, and do r B'RB r' to pair up the edges. Repeat a-c until all inner edges are paired up. Phase 4: Solve the cube as a 3×3×3. Solve the cube as far as possible using any method for the 3×3×3 cube. which swaps the UF and UB edge pairs. The cube is now solvable like a 3×3×3 cube again. The Crazy Cube I is now solved. The Crazy Cube II and III however still have small outer centre pieces that need solving. Mix the cube up as a 2×2×2 cube, using only double layer turns. Each 'corner piece' (2×2×2 block) contains three pairs of centre pieces. One way to remember which of these small pieces form a pair is to think of them as pointing towards each other. Below is a move sequence that cycles three pairs of the centre pieces. To apply it, you need to use double layer moves to place the three pairs you want to cycle at the locations UbR-BuR, FuR-UfR, and LuF-UlF. Prefer to use corners with more than one unsolved pair over those with just one pair. To cycle UbR-BuR, FuR-UfR, and LuF-UlF, do the sequence b l b' R b l' b R'. Repeat steps b-c until all the centre pairs match the colours of their adjacent edges. Note that when only a few unsolved pairs are left they might not all lie in different 2×2×2 blocks. The preferential treatment in step b for corners with multiple incorrect pairs usually help avoid this situation where you need to disturb already solved pairs. On the Crazy Cube III the centre corner pieces will automatically become solved too. Solve the cube as a 2×2×2 cube, using only double layer turns.